Have you faced this situation? You have been emailing back and forth with a team member about an issue you feel strongly about. And unfortunately, not much progress is being made. You switch tactics and move from writing to having a focused face -to -face conversation. Eureka! You reach a workable resolution. Or – you have been tasked with finding the best technological solution to a vexing problem and have spent many hours listening to the suggestions from people within your company. You decide to expand beyond engaged listening and add to your knowledge base. You put your question out to an industry group on social media and discover just the right solution. Introverts are most successful when they stop trying to act like extroverts and rely on their own natural strengths. They move back and forth between these strengths with intention. 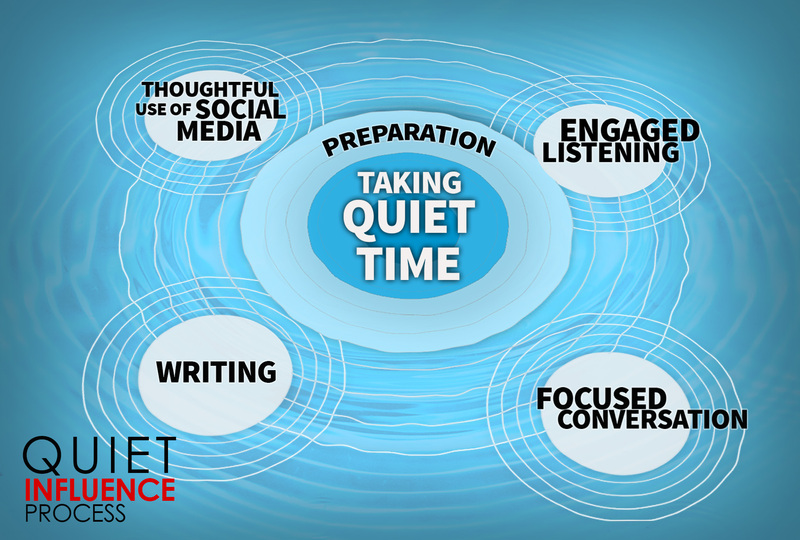 Since Quiet Influence was published in 2013, The Quiet Influence Process has served as a practical tool to be used in planning and executing a strong set of influencing behaviors. 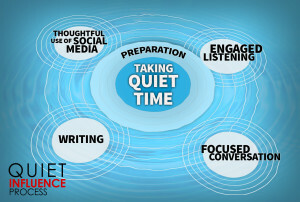 What is the Quiet Influence Process? It starts with Taking Quiet Time which taps into self-awareness, creativity and energy. Building on that, quiet influencers Prepare. This is the time when they create objectives and plan a viable strategy. Going out into the world they tap into Engaged Listening which creates strong rapport and understanding. Focused Conversations allow them to share their point of view, sell their ideas and give and get feedback. They also work through conflicts in this stage. Writing is a strength they build on to clarify their thinking and share their ideas with others. Finally a Thoughtful Use of Social Media allows them to reach a broader and more distant audience than ever before. Recently I made the QI Process available as a downloadable PDF to keep handy for those moments throughout the day when you are deciding on your best next step. Feel free to use it and let me know how it works for you. Learn from the lessons of successful introverted leaders and influencers who draw from their six natural strengths to make a difference in their organizations so that you can do the same in yours. This entry was posted in Uncategorized on April 5, 2015 by Jennifer Kahnweiler.